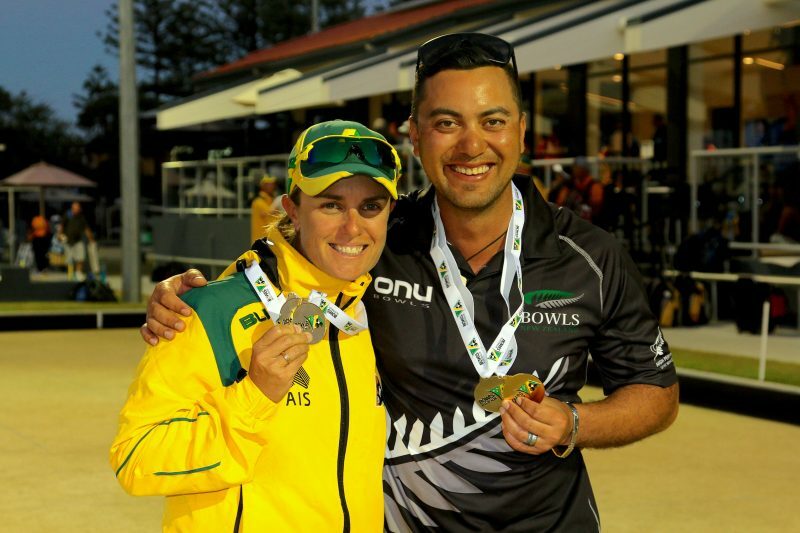 THE hosting Australian bowls team dominated today’s finals in the Gold Coast Multi-Nations tournament at the Broadbeach Bowls Club in Queensland. And in something of a declaration of Australia’s depth of talent, a ‘second string’ line-up was pressed into service when only seven acceptances to compete in the traditional rehearsal staged a year out from either World Bowls or Commonwealth Games were received. The two home-grown teams, dubbed ‘Australia Gold’ and ‘Australia Green’, won three gold medals apiece, while New Zealand won the remaining two. And there was a little déjà vu when reigning world champions from Christchurch last December, Shannon McIlroy from New Zealand and legendary Aussie Karen Murphy, came up with gold in the blue ribbon singles competition – defeating world No.1’s Alex Marshall from Scotland and New Zealand’s Jo Edwards respectively – while NZ’s Ali Forsyth and Mike Kernaghan, with two new chums in their Christchurch golden four, repeated the dose. MEN’S PAIRS: Final standings: NZL 18 points +59 shots; AUS-Green 16 +29; AUS-Gold 15 +11; MAS 12 +7; SCO 10 +4; HKC 6 -27; WAL 3 -37; CAN 3 -46. Medal play-offs: gold/silver: Australia GREEN (Barrie Lester, Nathan Rice) d New Zealand (Mike Kernaghan, Shannon McIlroy) 16-14; bronze: Australia GOLD (Brett Wilkie, Aaron Wilson) d Malaysia (Hizlee Rais, Fairul Muin) 16-15. MEN’S TRIPLES: Final standings: AUS-Green 21 points +90 shots; AUS-Gold 15 +47; NZL 15 +30; MAS 12 -2; SCO 7 -9; WAL 6 -34; CAN 4 -50; HKC 2 -72. Medal play-offs: gold/silver: Australia GREEN (Wayne Ruediger, Corey Wedlock, Aron Sherriff) d Australia GOLD (Ray Pearse, Aaron Teys, Scott Thulborn) 22-12; bronze: New Zealand (Mike Nagy, Blake Signal, Ali Forsyth) d Malaysia (Fairus Jabal, Syamil Syazwan, Soufi Rusli) 20-12. MEN’S SINGLES: Final standings: NZL 21 points +50 shots; SCO 15 +25; AUS-Green 12 +16; AUS-Gold 12 +1; MAS 12 -8; WAL 9 +16; HKC 3 -37; CAN 0 -63. Medal play-offs: gold/silver: New Zealand (Shannon McIlroy) d Scotland (Alex Marshall) 21-18; bronze: Australia GREEN (Barrie Lester) d Australia GOLD (Ray Pearse) 21-17. MEN’S FOURS: Final standings: AUS-Gold 18 points +31 shots; NZL 18 +21; Aust-Green 12 +28; MAS 10 -4; CAN 9 -2; WAL 9 -4; SCO 7 -8; HKC 0 -62. Medal play-offs: gold/silver: New Zealand (Tony Grantham, Mike Kernaghan, Paul Girdler, Ali Forsyth) d Australia GOLD (Brett Wilkie, Aaron Teys, Aaron Wilson, Scott Thulborn) 17-9; bronze: Australia GREEN (Wayne Ruediger, Corey Wedlock, Nathan Rice, Aron Sherriff) d Malaysia (Fairus Jabal, Syamil Syazwan, Hizlee Rais, Fairul Muin) 20-10. WOMEN’S PAIRS: Final standings: AUS-Gold 18 points +53 shots; SCO 15 +33; WAL 15 +2; MAS 12 +16; NZL 12 +13; CAN 9 -27; AUS-Green 3 -6; HKC 0 -84. Medal play-offs: gold/silver: Australia GOLD (Lynsey Clarke, Karen Murphy) d Scotland (Claire Johnston, Caroline Brown) 21-5; bronze: Malaysia (Emma Firyana Saroji, Siti Zalina Ahmad) d Wales (Laura Daniels, Jess Sims) 18-11. WOMEN’S TRIPLES: Final standings: NZL 17 points +41 shots; AUS-Green 13 +43; SCO 13 +18; AUS-Gold 12 +26; WAL 10 -7; CAN 7 -40; MAS 6 -24; HKC 3 -57. Medal play-offs: gold/silver: Australia GREEN (Carla Krizanic, Natasha Scott, Bec Van Asch) d New Zealand (Tayla Bruce, Val Smith, Katelyn Inch) 23-11; bronze: Australia GOLD (Ellen Ryan, Bolivia Millerick, Kelsey Cottrell) d Scotland (Lesley Doig, Kay Moran, Stacey McDougall) 19-12. WOMEN’S SINGLES: Final standings: NZL 15 points +53 shots; AUS-Gold 15 +26; MAS 13 +14; AUS-Green 12 +18; SCO 12 +13; HKC 6 -40; CAN 6 -43; WAL 4 -41. Medal play-offs: gold/silver: Australia GOLD (Karen Murphy) d New Zealand (Jo Edwards) 21-14; bronze: Australia GREEN (Natasha Scott) d Malaysia (Emma Firyana Saroji) 21-12. WOMEN’S FOURS: Final standings: AUS-Gold 16 points +57 shots; AUS-Green 15 +39; NZL 13 +20; CAN 13 -10; MAS 9 -18; HKC 6 -15; WAL 4 -36; SCO 4 -37. Medal play-offs: gold/silver: Australia GOLD (Lynsey Clarke, Bolivia Millerick, Ellen Ryan, Kelsey Cottrell) d Australia GREEN (Chloe Stewart, Kristina Krstic, Carla Krizanic, Rebecca Van Asch) 12-11; bronze: Canada (Joanna Cooper, Pricilla Westlake, Leanne Chinery, Kelly McKerihen) d New Zealand (Selena Goddard, Angela Boyd, Kirsten Edwards, Katelyn Inch) 10-8. Photo: Gold Coast Multi-Nations singles winners, and reigning world champions, Karen Murphy from Australia and New Zealand’s Shannon McIlroy.